The Semmering Railway is the first mountain railway which crossed a high-mountains area and counts therefore as the prototype of railway lines mastering very difficult terrain and considerable altitude difference. The railway was constructed between 1848 and 1854 by some 20,000 workers under the project's designer and director Carl Ritter von Ghega. He had to develop new surveying methods and instruments to mark out the terrain. The construction features 14 tunnels (among them the 1,431 m vertex tunnel), 16 viaducts (several two-story) and over 100 curved stone bridges as well as 11 small iron bridges. It uses an Alpine crossing that had been in use since the Middle Ages, and which linked Vienna with Venice and later Trieste (then an Austrian port). Transport across was done with wagons and pack animals. Archduke Johann wanted to connect the northern and southern parts of his monarchy by means of a railway. 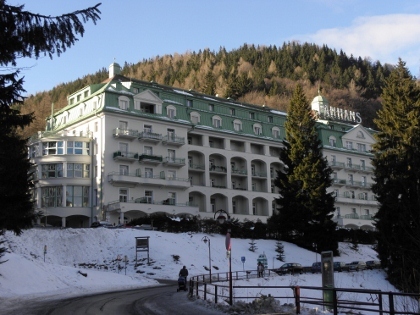 Travel time was cut in half, and it opened up the Semmering region as an early Alpine resort. 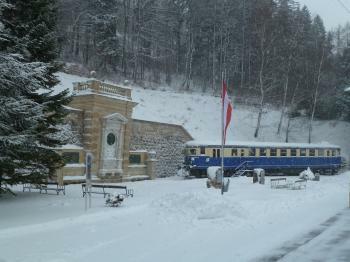 I had my first run on the Semmering Railway on board of the regular train between Vienna and Graz. It’s warm, it has free wifi and it delivers a WHS visit without any effort. Although the railway was a major work of engineering in its day, today it’s not a spectacular ride any more. The fast train winds easily around the many curves. The mountain pass at 895m even isn’t that high. The only difference between both sides of the mountain during my visit was that snow covered the fields at the south side, where the Vienna side had been completely green. The next morning I took one of the few trains from Graz that actually stop at Semmering. Unfortunately most of the “attractions” along the railway are closed during winter. Such as the small museums, and also the hiking path that follows the complete route. Walk all the way to Gloggnitz or Mürzzuschlag must be a good excursion in the summer months. As there wasn’t much snow on the ground, I decided to walk a little anyway along this path. It gave me the opportunity to take a closer look at one of the tunnel entrances – nothing too exciting. However I had decided to get out at Semmering because of the fine piece of cultural history that is part of the nomination file. Although the core zone of this WHS only covers the railway line and associated constructions, its importance also lies in the cultural landscape shaped by early tourism that was made possible by the railway. Semmering still has many villas and hotels from this period – some in Jugendstil, others in a more vernacular Alpine style. It’s a fine walk along these via the Hochstrasse and Südbahnstrasse, two long and winding roads in the upper town. Here you encounter two huge old hotels: one (the Südbahn) has already been left to decay, the other (the Panhans) has 400 rooms and houses a hotel training school. According to a news item I found on the internet, it has filed for bankruptcy too earlier this year. Many of the villas are hidden behind trees, and seem to be still privately inhabited. 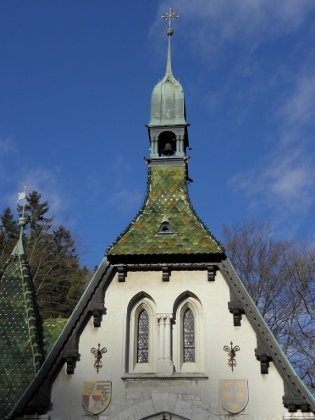 One of the prettiest buildings in Semmering I found the small parochial church. It dates from 1894/1895 and was designed in a wonderful turn-of-the-century style. I had lunch in one of the restaurants near the ski slopes – this still is an active ski resort, they even host a women’s world cup match the day after my visit. I visited this WHS in July 2017. I completed all Austrian WHS with this trainspotting visit so as such it will always have a special place in my memory. The Semmering Railway was built between 1848 and 1854 under the supervision of Carl Ritter von Ghega. 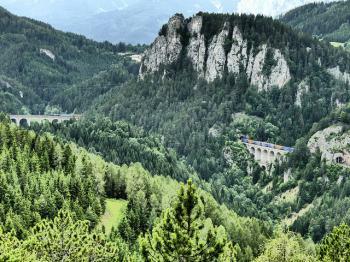 It is the world's first high mountain railway and is part of the Sudbahn which stretches from Vienna to Trieste. It reaches from Gloggnitz to Murzzuschlag over a distance of 41.8km, crossing the Semmering (984m). The numerous gorges, rift valleys, rock faces and mountain ridges had to be made accessible for rail traffic by 15 tunnels, 16 viaducts and 100 bridges. By car (and some pleasant hiking trails), I saw the Haupt tunnel, the Kartner Kagel tunnel, the Weberkagel tunnel, the Polleres tunnel and viaduct, the Krausel tunnel and viaduct, the Semmering railway station, the Breitenstein viaducts and the Kalte rinne (790m) along the Semmering Hochstrasse and Bahnwanderweg. The highlight of my visit was hiking along the Bahnwanderweg (around 1 hour hike on the Spiestal-Breitenstein trail) and trainspotting at the scenic 20 Schilling panoramic viewpoint of Breitenstein. I parked my car next to the Kunst + Technik Skulpturen Park and there is a small trail which starts right behind the small football pitch there. I was surprised to find out that trains (both passenger and cargo trains) pass through the single rail Breitenstein viaduct from both directions so they are timed to pass at different intervals to allow safe passage through the rather busy railway. There are information boards in English and German at most viewpoints and at every significant railway infrastructure. I also visited the Semmering Railway Information Point and Museum which is open daily from 9am till 3pm. 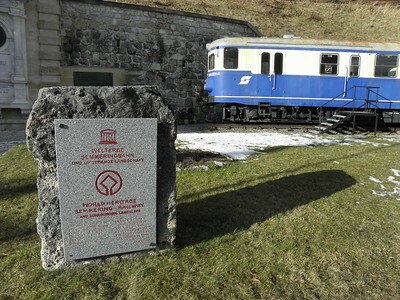 There is a UNESCO WHS inscription plaque at the railway station just in front of the only fountain. All in all, this WHS is rather similar to the Rhaetian Railways WHS and quite an interesting WHS. To really appreciate the railway infrastructure though, I would recommend going on some pleasant hiking trails instead of spending a lot of money on a train ticket. You won't be able to see much of the railway infrastructure if you're on the train but rather passing on it or through it perhaps without even knowing! We had a Coupon to go from Vienna to Munich. Instead of going straight we went via Semmering. The tracks were covered in snow and the landscape had a very special flair. Unfortunately we were not sitting in a steam engined Train. It is not that often that traveling between one World Heritage site and another will mean you visit a third. However if you catch a train between Vienna and Graz, the Semmering railway does exactly that. I left Vienna in glorious winter sunshine, but about an hour out the clouds started to look a little more ominous. When I entered the WHS section at Glognitz, there were the first few flakes of snow. As the train pulled onwards the snow became thicker, the scenery more remarkable, the bends more regular, the drop at the side of the track even larger and the feats of engineering more impressive. We stopped briefly at Semmering station where I was able to get off for a jog along the platform to take a picture and have a quick chat with the conductor. He didn't view me with as much amusement as I thought he would, so perhaps there are a fair few people who appreciate that they are travelling over a World Heritage Site and like to take pictures of it, or maybe he was just humouring me. Either way it was nice to be able to get off and see how deep the snow had become, before shuffling back to my cabin to warm up and enjoy watching the snow gradually abating by the time we got down to the end of the WHS at Mürzzuschlag. The bright clear skies had returned by the time we rolled into Graz, leaving a rather magical memory of my trip along the Semmeringbahn. The snow made it so unlike the rest of the trip that it was almost as if I had dreamt it. Whilst it may not be the most spectacular mountain railway in the world, it was the first to cross the Alps and the fact that it is still in use today is a massive testament to its outstanding universal value. If you want to travel on a similar trip as me it is well worth booking your seat in advance. By doing this I managed to get my trip in first class! for half the price of the standard class fare I would have paid if I had just turned up on the day. The fact I was able to get a free breakfast in the lounge at the station in Vienna and had a whole first class cabin to myself just made the whole trip so much better. Besides the feats of engineering and of nature that make this railway spectacular, I enjoyed visiting the exhibits arranged at stations along the route. There were the photographic exhibitions at Glognitz and Murzzuschlag. 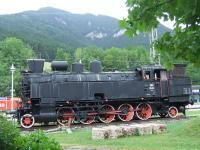 At Payerbach-Reichenau there was an original steam locomotive and other memorabilia. At Semmering there was an indoor exhibition of the construction process and a model, and outdoor exhibits as well as a memorial to Carl Ritter von Ghega. 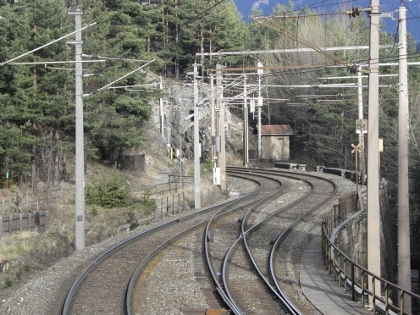 The Semmeringbahn (1848-54) is an outstanding and early example of a line keeping a constant gradient, but engaging in tunnels, viaducts and constant curves to keep the gradient even. In this, it follows the Ffestiniog Railway in Wales (1832-36), but is on a much grander scale. Special locomotives had to be developed to work the Semmeringbahn and the Semmering Trials of 1851 gave rise to the types of flexible locomotive which are now widespread through the world, though now they are driven by diesel or electric power rather than steam! The Semmering Railway is one of the masterpieces of 19th century architecture and engineering, but you have to be very interested in technology and related fields (I'm not) to appreciate these aspects of the railway (the viaducts are impressive though). Instead, do a nice daytrip from Vienna (or Graz) and enjoy the beautiful landscape in the area. Every train from Vienna to points south (Graz, Villach, all cities in Italy, Croatia, Slovenia) takes the Semmering pass route (at least until the construction of the railway tunnel, which is still in its planning stages), but you have to use the local trains with the destination "Mürzzuschlag" to be able to get off at the small town of Semmering at the top of the pass. There are numerous hiking trails (and skiing areas) there, as well as many hotels and pensions, many from the late 19th century, when the area was a favorite countryside retreat for wealthy Viennese.